StoryNexus games are based around the idea of a limited set of actions, which you use up, and then regenerate over time. This model has lots of advantages - it makes your content last longer, encourages players to come back, and leads to any number of mini-cliffhangers whenever the player's actions run out. For playtesting, though, it can be a real inconvenience. You don't want your friends to have to wait half a day before they can carry on testing your game. And you don't want them to have to spend Nex to refresh their actions, either. It would be nice if you could give specific people unlimited actions - but unfortunately, StoryNexus doesn't allow that (yet). Never fear! The following technique will give your chosen few the next-best thing - an in-game object, which they can use to refresh their actions for free, whenever they run out. We're going to identify playtesters by adding a specific Thing to their inventory. I've called mine the Playtester's Passkey, and I'll refer to it as the Passkey below. But feel free to choose something more thematic (Amulet Of Rapid Regeneration, say, or whatever fits in your world). Note that I've turned on Persistent, which means that your playtesters will keep the Passkey even if they restart your world. I've also added some text to the Description to make clear this is a special object, which ordinary players won't have. In general, you want playtesters to experience the world in the same way ordinary players will - the last thing you need is for them to unknowingly use special powers to work their way round a problem in the game. Adding the Passkey breaks that general rule. But provided you add a clear message to the Description, then if a playtester finds they have to use their Passkey to complete the game, they at least stand a fighting chance of noticing that something's gone wrong. How you deliver the Storylet will depend on your world. In my case, I've created an Always card which appears in every area. That's probably what you want, but there are a few other possibilities - see "Further ideas", below. The most important thing here is that the storylet is set to "Playtester's Passkey: Min 1", which means that players who don't have the Passkey won't even see it. And once again, it's a good idea to explain in the Description that this is a special card, which normal players won't see. The trick is to set the branch up so that it doesn't cost an action to play. If you don't do that, then you'll have a classic chicken and egg situation - your playtesters will want to play the branch to refresh their actions, but if they don't have any actions they can't play the branch! To set that up, first you'll have to click the button next to Advanced Options, to reveal the extra options shown in the screenshot. You can then set the Action Cost to zero. Don't forget to press Save. Again, you'll have to click the button next to Advanced Options, to reveal the extra options shown in the screenshot. You can then set Exotic Effect as shown. Don't forget to press Save. That's the Storylet finished. 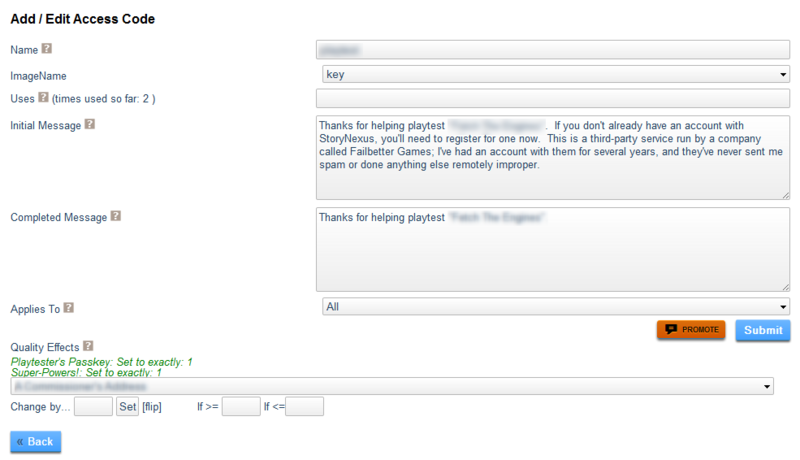 So, to recap: you now have a Thing called the Playtester's Passkey, and a Storylet - visible only to people who have the Passkey - which refreshes their actions on demand. The only problem is that nobody has the Passkey yet… so let's fix that now. Set up the fields as shown, and press Tweak. It's as simple as that. Your playtester now has the Passkey, and will see the Storylet. Job done! This is an advanced step. If you haven't found the steps above relatively straightforward, then you probably want to stop here. The disadvantage of handing out the Passkey one player at a time, as described in Step Three, is that you have to co-ordinate with each new playtester. They need to create their character, and tell you the name, and then you have to give them the Passkey. There's a way round that, though, using access codes. There are a couple of nice details here. 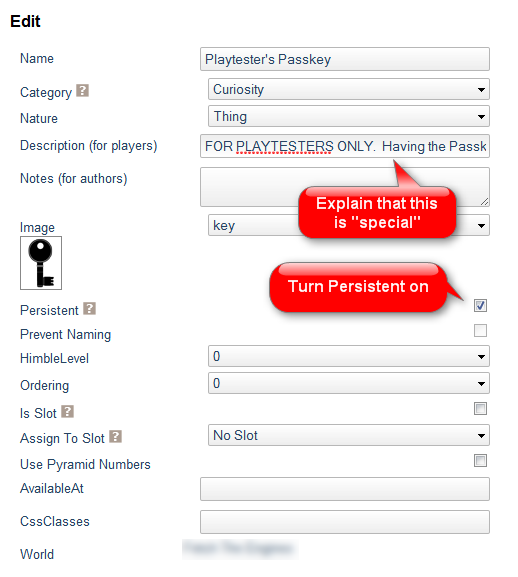 First of all, because you can set a message to be displayed when the access code is used, you have an opportunity to guide new playtesters through the process of creating a StoryNexus account. And second, because the system tracks how many times the code is used, it's easy to tell how many people have playtested. Beware though! Anyone who knows the access code can make themselves a playtester. So you probably want to set it to something password-like, rather than something guessable like "playtest". As I've described it above, the Storylet is an Always card. The benefit of that approach is that it's highly visible, so it's easy for your playtesters to find, particularly when they start seeing messages about refreshing actions by spending Nex. However, if you have a small group of experienced playtesters and trust them to follow instructions, it would certainly be more elegant to make the Storylet a usable option of the Passkey. You might want to add more options to your playtesters' Storylet. For example, you might want to give them the option to immediately end the game, so they can start again from the beginning. Be careful though - remember that you want your playtesters to experience the game in the same way that ordinary users do, so (for example) giving them options which bypass grind might not be a great idea. You might want to have different classes of playtester. If so, you can just create more Things in a similar way to the Passkey. For example, I have a Thing called Trusted Advisor which I give to playtesters I actually know (as opposed to friends of friends and so on). I have an access code which confers both the Passkey and Trusted Advisor, and an access code which confers the Passkey alone. For maximum elegance, you might want to create a Container Thing to hold your Passkey (and any similar items). I've called mine "Super-Powers". The benefit of doing that is that it separates the special objects into a clearly-separate part of the inventory, which again helps playtesters to understand that they won't normally be there. Have I missed anything? Edit the page to add your own ideas here!